Welcome to my stop on the book tour for SLAY ON TOUR. My thanks to the author Kim Curran, to Stevie Hopwood and publisher Usborne Books. 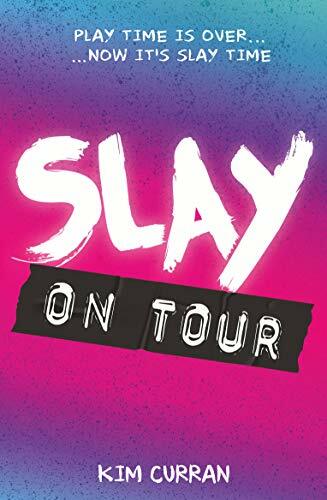 SLAY are back in SLAY ON TOUR and I am so happy about it. I loved the first book so much. As the boys, Milly and Gail head to Japan after an SOS from a friend regarding an annoying demon. They soon get sucked into a new adventure but is all that it seems. When they meet a mysterious man at a Japanese television station who has a J Pop band in a silver case. The team decide to stay a while to help fight more demons and find out more about the band. This book is perfect for young teens, it takes them to the next level of reading with more mature topics. Perfect for those aged twelve plus. I really enjoy the writing style of Kim Curran. The descriptions of the demons are amazing and I love them all. I really love the vibrant unisex covers too. These books are both great for special occasions or to buy with treat money.